LAS VEGAS. Mike Stafford isn’t just Adrien Broner’s boxing teacher but also his father-figure and on the eve of The Problem’s biggest fight of his career, predicted a ninth round knockout win over defending WBA welterweight champion Sen. Manny Pacquiao at the MGM Grand Garden Arena here tonight (tomorrow morning, Manila). Stafford, 62, said Broner walked into his gym in Cincinnati when he was seven and they hit it off. Broner, who has a twin brother Andre, two other brothers and a sister, was raised by his mother Dorothy whose surname he took. 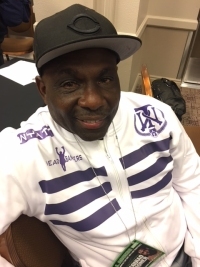 According to Stafford, Broner doesn’t know much about his biological father but his stepfather Thomas Knight will be at the fight. “AB is a natural left-hander but when he was 10 or 11, I converted him to orthodox,” said Stafford. “He can switch-hit but rarely does. He’s not like Terrence Crawford. AB never went to the Olympics or World Championships as an amateur. When he was 17, AB was imprisoned for about eight months then released after he was acquitted of a robbery charge. He missed the boxoffs for the Olympic team by a day because of his imprisonment. Shelly Finkel was his manager in his early years as a pro before he joined Al Haymon. I can’t tell you how much his contract with Al is worth but I can confirm it’s huge.” The scuttlebutt is he signed a $50 Million, five-fight contract but a source said it won’t hold once he loses. His contract to fight Pacquiao is rumored to be $10 Million but it could be less. Stafford said former narcotics detective Kevin Cunningham, who has coached several world champions, is now Broner’s lead trainer, taking over from him. “Kevin’s been on and off with us for about 10 to 15 fights but AB wanted him to take the lead role in camp starting his last fight against Jessie Vargas. We all work together as a team,” he said. Stafford said what sets Broner apart from other fighters is his intelligence. “He’s smart,” he said. “He’s got a powerful left hook and a right straight. Weight was never a problem. He can easily make 135 pounds because he’s not big-boned.” The heaviest Broner has scaled for a fight was 146 3/4 in outpointing Paul Malignaggi by split decision in Broolyn in 2013. Stafford said Broner has eight children, the last two with his girlfriend Arie Nicole. Broner, 29, has vowed to showcase the power of the ‘hood against Pacquiao.